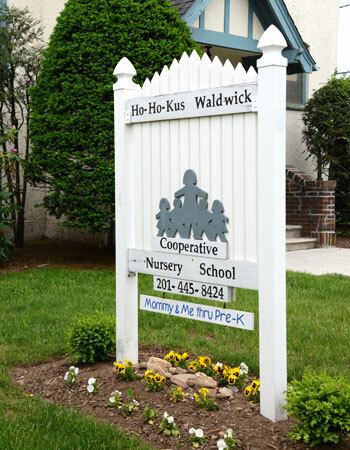 Ho-Ho-Kus Waldwick Cooperative Nursery School (HWCNS), located in Ho-Ho-Kus, New Jersey, was founded in 1969 and is owned and administered by the parent members. It is incorporated and state approved as a non-profit, non-sectarian educational organization. Our teachers are professionally trained and certified to teach preschool and provide an educational experience to our young students in a warm and loving environment. Our school does not discriminate on the basis of religion or national origin with respect to student admission, programs, scholarships or employment. The unique educational concept of a cooperative nursery school allows parents a voice in decisions concerning their child's education and the opportunity to observe and participate in those first steps outside the home. As a co-op, parents directly guide the school’s program through membership meetings, informal discussions and an elected Executive Board. All parents on the Board volunteer their time in positions such as President, Registrar and Chairs of various committees. Membership and full participation on a committee and the attendance at parent meetings are required of all parents to facilitate daily operation of the school. Parents participate in the classroom with the teacher once a month. Each student benefits from the professional talents of the teacher and the contributions of the parents.